React components with state render UI based on that state. When the state of components changes, so does the component UI. That makes understanding when and how to change the state of your component important. 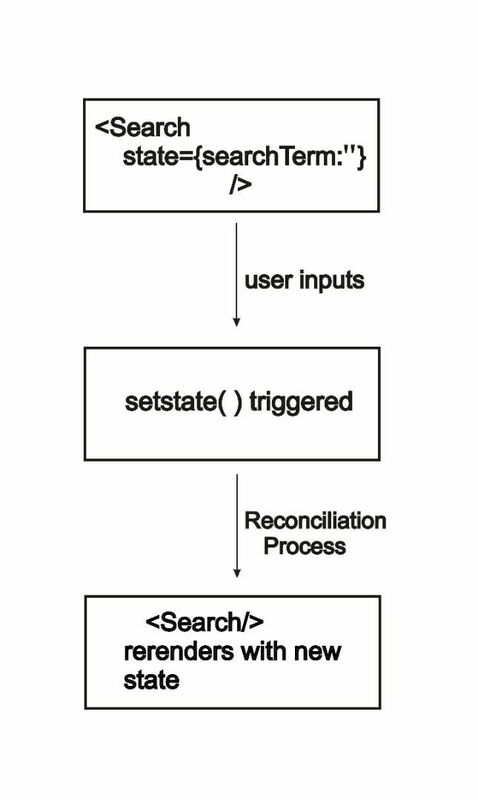 At the end of this tutorial, you should know how setState works, and be able to avoid common pitfalls that many of us hit when when learning React. setState() is the only legitimate way to update state after the initial state setup. Let’s say we have a search component and want to display the search term a user submits. We’re passing an empty string as a value and, to update the state of searchTerm, we have to call setState(). Here, we’re passing an object to setState(). The object contains the part of the state we want to update which, in this case, is the value of searchTerm. React takes this value and merges it into the object that needs it. It’s sort of like the Search component asks what it should use for the value of searchTerm and setState() responds with an answer. This is basically kicking off a process that React calls reconciliation. The reconciliation process is the way React updates the DOM, by making changes to the component based on the change in state. When the request to setState() is triggered, React creates a new tree containing the reactive elements in the component (along with the updated state). This tree is used to figure out how the Search component’s UI should change in response to the state change by comparing it with the elements of the previous tree. React knows which changes to implement and will only update the parts of the DOM where necessary. This is why React is fast. All <div> tags become <span> tags and the whole component tree will be updated as a result. The rule of thumb is to never mutate state directly. Always use setState() to change state. Modifying state directly, like the snippet below will not cause the component to re-render. To demonstrate this idea further, let's create a simple counter that increments and decrements on click. See the Pen setState Pen by Kingsley Silas Chijioke (@kinsomicrote) on CodePen. At this point, the counter simply increments or decrements the count by 1 on each click. If you are coding along at home, you might be surprised to find that doesn’t work. So instead of the call happening three times, it happens just once. This can be fixed by passing a function to setState(). Just as you pass objects to setState(), you can also pass functions, and that is the way out of the situation above. ...we can now increment count three times with one click. In this case, instead of merging, React queues the function calls in the order they are made and updates the entire state ones it is done. This updates the state of count to 3 instead of 1. When building React applications, there are times when you'll want to calculate state based the component’s previous state. You cannot always trust this.state to hold the correct state immediately after calling setState(), as it is always equal to the state rendered on the screen. What we want is the ability to decrement by 3. The changeCount() function is called three times in a function that handles the click event, like this. Each time the button to decrement is clicked, the count will decrement by 1 instead of 3. This is because the this.state.count does not get updated until the component has been re-rendered. The solution is to use an updater. An updater allows you access the current state and put it to use immediately to update other items. So the changeCount() function will look like this. Now we are not depending on the result of this.state. The states of count are built on each other so we are able to access the correct state which changes with each call to changeCount(). setState() should be treated asynchronously — in other words, do not always expect that the state has changed after calling setState(). Do not depend on this.state immediately after calling setState() and make use of the updater function instead. And what about the call back of the setState function? As far as I know, you can pass a callback function to the setState function that always executes ONCE the change has been applied to the state. Of course this is not the one and only solution for chaining actions but for just one thing to execute after a setState, it’s the way to go.